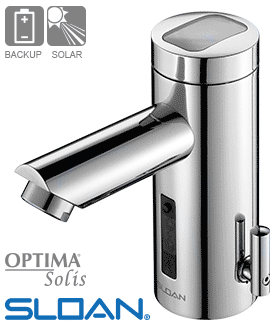 Sloan SOLIS EAF-275 deck-mount, chrome-plated cast brass electronic faucets are powered by solar energy: Any natural or artificial light source will generate enough energy to operate the sensor. 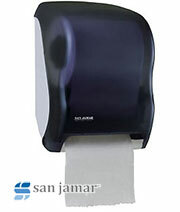 An optional control lever on the side of the one-piece faucet allows restroom visitors to set the faucet to the desired temperature. The first solar-powered electronic faucet integrated with a solar-panel transforming light into electrical energy. Powered by sunlight or artificial light, including LED, halogen, incandescent and fluorescent light; the unique solar-powered module utilizes any light source to efficiently extend the useful battery life. 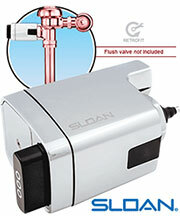 Sloan's EAF-275 electronic hands-free handwashing faucet is activated when the dual-infrared sensor detects a user's hands. 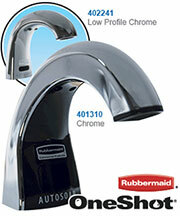 An optional integral mixer located conveniently on the faucet allows the user to adjust the water temperature as desired.